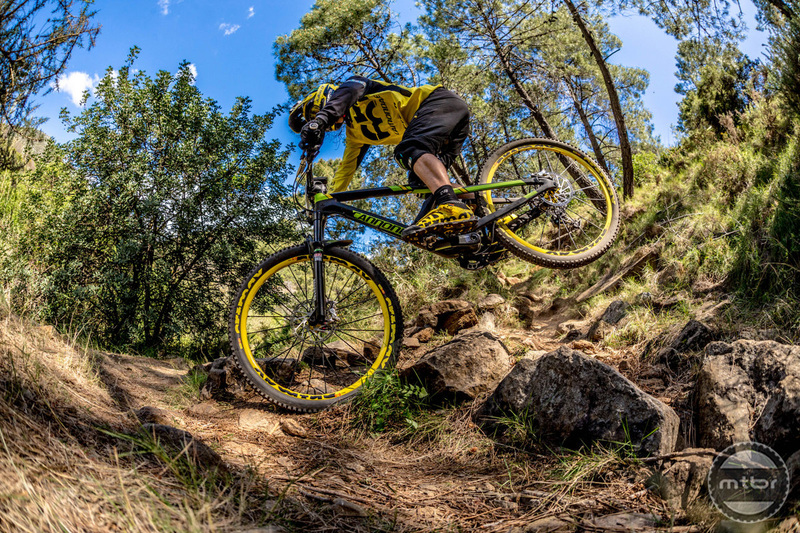 Cannondale’s Enduro bike arrives with 160mm of travel, 27.5 wheels and a Lefty SuperMax fork that is ready to rumble. All Photos Copyrighted by Cannondale Corp. This is Cannondale‘s Enduro bike and we were disappointed that it could not be included in the Mtbr Enduro Compare-O testing. It simply wasn’t available back in January and we just got back from testing the first production models of these bikes that will hit showroom floors in June of this year. It’s 160mm of front and rear travel on a brand new 27.5 platform for Cannondale. It was developed with Cannondale’s proprietary technologies like the DYAD shock and the Lefty fork and although we cringe at the word ‘proprietary’, we are not universally opposed to it as long as it delivers an inherent advantage. And that it does. This Jekyll is indeed a special bike and it is worthy of consideration if you’re looking for that bike that will allow you to overdo what you thought you were capable of. Racers just get paid and they’ll ride whatever right? Well, it goes beyond that, specially here. Jerome Clementz is his own corporation and and he manages his own team with girlfriend and teammate Pauline Dieffenhaller. They take care of their own equipment, get themselves to races and produce their own materials and videos. It’s a cool model that allows them to provide a service and a product to their sponsors. Of course, it’s all predicated on winning so he has to have a bike that allows him to win. And as you’ll see in the video above, Jerome is deeply involved in research and testing of these Cannondale bikes. Mark Weir is in the same boat. And although he cannot join the twenty year olds anymore in the gravity-oriented podiums, he offers an R&D mind that is extremely valuable to Cannondale. In addition, Mark Weir has a circle of shredders in Moeschler, Cruz, and Osborne and he’s recruited them in this quest to develop good bikes with Cannondale. 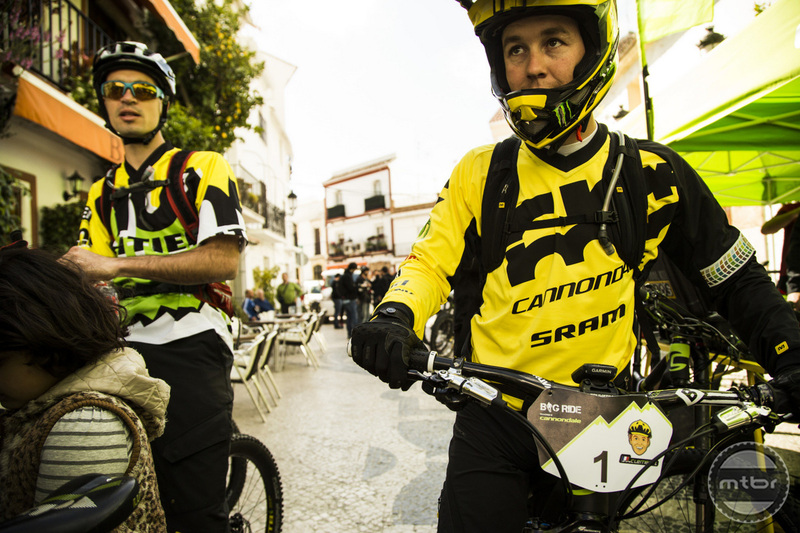 Cannondale has not been a force in Trail and All Mountain bikes and they’ve invested heavily to change that. So in your opinion how did the new lefty stack up to the Pike? >>So in your opinion how did the new lefty stack up to the Pike? I think they are close. The Lefty is stiffer steering-wise and a bit more active under very heavy braking. The Pike is a little more buttery smooth and maybe more mid-stroke support. But they are both best of breed and I need more time on each on the exact same trail. Based on your limited time spent on the Jekyll where would you see it fall in the Compare-O lineup? >>Based on your limited time spent on the Jekyll where would you see it fall in the Compare-O lineup? I think it’s right there with the SC Bronson and the Rocky Mountain Altitude. It’s plusher than the Bronson since it has 160mm travel instead of 150mm. They seem equally stiff laterally. The Bronson has VPP so it climbs well and accelerates well on its own. Very tech climbs is not awesome. The Jekyll has a climbing mode so one has to activiely switch it between Climb and Descend mode. Rocky Mountain is right there with the Jekyll in terms of big hit ability. The Magura’s have a special feature which allows for quicker wheelchanges on the Lefty. How about brake performance ? The VPP system remains active under braking. The Jekyll and Rocky are in theory monopivots, so is there any noticeable brake-jack ? The Rocky Mountain is not a mono-pivot like the Cannondale (in theory or reality); it is a true 4-bar descended from Rocky’s old ETS suspension platform. The drop-out is on the seatstay, not the chainstay. It is similar to specialized, but avoids the FSR patent because seatstay/chainstay pivot is slightly above the rear axle (on the ETS, it was way above). The Rocky suspension is active under pedaling and braking. This is incorrect. The Rocky Mountain is a modified single pivot system just like the cannondale. There is no pivot between the main pivot and the rear axle, the wheel is attached by a simple swing-arm. Like many systems out there, it uses further linkage above the swing-arm to tune the suspension to RM’s liking, but it is both in theory and reality a single pivot bike. By definition it is not fully active, especially under heavy braking and pedaling. I own a Jekyll 800 (circa 2002/3) and an Prophet 2000 (circa 2005) MTB (as well as a road bike). Without a doubt, the Jekyll’s geometry fit me perfectly. I never felt more balanced on a bike than that one. People give a lot of crap to the Lefty fork – uncertain whether it can handle the punishment. I can attest – it can. I rode a skinny over a large fallen tree (30 degree incline – elevation gain 5 feet). We were moving along pretty quickly. Being in the lead, I thought the trail would continue straight on. It didn’t. At the apex of the climb, the leeward side of the trail abruptly turned right. I missed the turn and went right over tree. I think on any other ride I would have face-planted. This Jekyll, though…My front wheel hit the ground and I hit the brakes. My shock absorbed every bit of it. I was able to maintain my balance, did a slight front-wheel-hop away from the tree and was able to land both wheels on the ground with me in my peddles. It was awesome! I can’t wait to test out this new Jekyll, either. Some of the best time I ever had were on my Jekyll 800. Jerome Clements has not won on a LEFTY! How could one consider a product being marketed by a sponsored rider then turns around and goes back to the 2 legged fork?